Digital breast tomosynthesis (DBT), when introduced in early 2011 as an FDA-approved technology for use in both breast cancer screening and diagnosis, presented as a promising technology but with cautions regarding optimum use and capabilities. Two years and several studies later, more women are selecting this imaging option, also known as 3D digital mammography, while breast imagers continue to weigh the pros and cons. With the approval of Hologic’s Selenia Dimensions system (Dimensions 3D), US hospitals and imaging facilities could offer women tomosynthesis along with conventional 2D digital mammography. According to Hologic, this system has been commercially available outside the United States since 2008, so the company has had time to work on optimizing hardware and software applications as well as image processing algorithms. Geisel was the principal investigator among a team of researchers at the university’s Smilow Cancer Hospital in New Haven, Connecticut, which recently announced results of a study on adding DBT to screening mammography. The retrospective review of 14,684 women who received screening mammograms at Yale from August 2011 through July 2012 showed an 11% increase in the rate of breast cancer detection among women who underwent both 2D and 3D screening. Geisel adds that tomosynthesis appeared to be more valuable in women with dense breast tissue, as 54% of the women whose cancer was found with tomosynthesis had dense breast tissue. Findings from this study related to women with dense breast tissue dovetail with the findings of another group of Yale researchers, which assessed the potential contribution of tomosynthesis to detecting breast cancer in high-risk patients, according to Geisel. Researchers in this study concluded that adding tomosynthesis to 2D mammography may improve the visualization of invasive cancers presenting as noncalcified lesions in high-risk women but also recommended further research in this area. A majority of the screening mammograms performed at Yale now include tomosynthesis, Geisel says, with the exception being women with breast implants and those with especially large breasts, who are already receiving extra views. The facility was an early adopter of this technology, and currently has three units and plans to add two more. Incorporating this technology into Yale’s breast imaging procedures has changed how Geisel reads mammograms, she says. According to Julian Marshall, senior director of global product management for Hologic’s breast imaging group, Dimensions 3D remains the only product approved by the FDA for 3D mammography. Other companies, including GE Healthcare and Siemens Healthcare, are developing 3D mammography systems but do not yet have FDA approval to market in the United States. He also refers to a recent study out of Italy, the STORM trial (Screening Tomosynthesis or Mammography), that showed similar results. For breast imagers, studies such as these are stepping-stones for advancing methods of screening for and diagnosing breast cancer. Some, however, progress more cautiously, continually looking for more information as to the benefits of this evolving technology. “This is more evidence of the potential usefulness of tomosynthesis,” says Carol Lee, MD, chair of the ACR Breast Imaging Communications Committee and a diagnostic radiologist at New York’s Memorial Sloan-Kettering Cancer Center. “It is important that we get this information and continue to refine which patients are best served by this type of screening. Following the announcement of the initial Oslo study findings, the ACR and the Society of Breast Imaging issued a statement saying, “While the study results are promising, they do not provide adequate information to define the role of tomosynthesis in clinical practice. Marshall notes that while DBT is believed to be beneficial for women of all types of breast compositions, the benefit for women with dense breasts is greater. However, whether or not this technology is offered to patients could come down to system availability, he says. In 2011, Elizabeth Wende Breast Care in Rochester, New York, was one of several clinical sites for Dimensions 3D. Attending radiologist Stamatia Destounis, MD, FACR, says since that time, the facility has added a second unit and is hoping to add a third because of the patient volume, particularly those at high risk of breast cancer. She says that with increased research and word of mouth among the patient population, DBT has become a frequent option at her facility. Clinicians don’t always rapidly adopt new medical technologies. Marshall says Hologic is pleased with tomosynthesis’ rate of adoption in the United States, especially compared with the rate at which its predecessor technology, digital mammography, was accepted. The company installed more 3D systems in the first year following approval than it did the first year following approval of its first 2D system. He attributes some of this difference to the fact that Hologic’s 2D system was designed for conversion to a 2D/3D system with a simple software upgrade. “Many of our customers were able to plan for and make the transition with little difficulty,” he says. For some hospitals and breast imaging facilities, the addition of such new technology isn’t as easy. With no reimbursement for DBT, the cost of purchasing these systems could become “an obstacle to adoption,” Geisel says. There’s also the issue of how to incorporate this process into a practice, for example, determining how to handle workflow if the practice can afford only one machine. Geisel notes that another potential drawback of combining 2D and 3D breast imaging is the increased radiation dose. Conducting these together means twice the dose, she says. This is more of an issue in the United States, where breast cancer screening exams are done every year, than in Europe, where screenings are done every two years, she adds. Hologic also is working to incorporate tomosynthesis into other aspects of breast cancer detection. Marshall says the company recently released a tomosynthesis biopsy package that allows radiologists to use the same modality for detection of abnormalities and localization for biopsy. He says this enhancement is especially useful for lesions visible only on 3D images. Breast imaging experts agree that with changes in technology will come more studies to fine-tune the effectiveness of tomosynthesis in breast cancer screening and diagnosis as well as who may best benefit from this technology. Geisel says that more studies like those conducted at Yale also will increase awareness of this technology. “With time and more studies, DBT will become the norm,” she says. Many also would agree that, as debate continues regarding the validity of even basic mammography, the introduction and adoption of new screening and diagnostic technology creates even more questions. — Kathy Hardy is freelance writer based in Phoenixville, Pennsylvania. 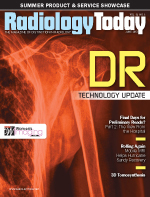 She writes primarily on women’s imaging topics for Radiology Today.